Published Jan 18, 2017 By Julia 17 CommentsThis post may contain affiliate links. 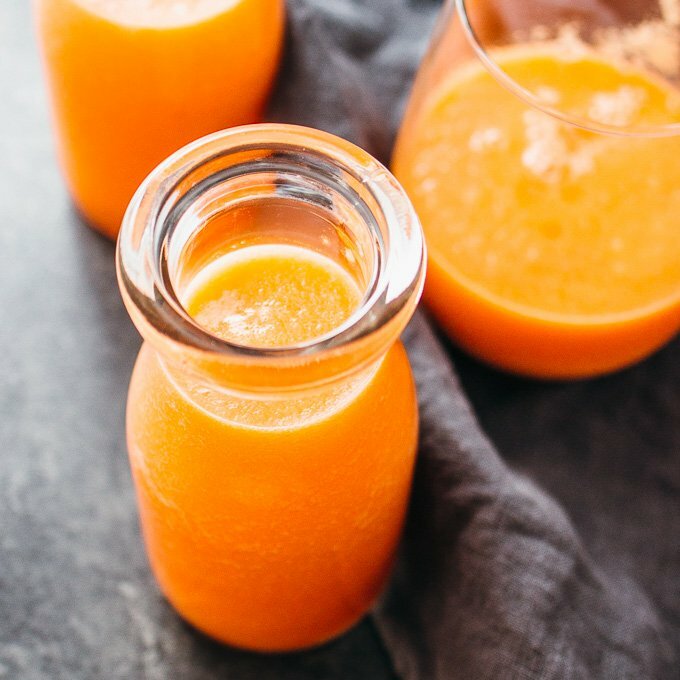 This pineapple smoothie is blended using carrots and fresh fruit such as chopped pineapples and bananas, and is easy to make with only 5 ingredients. This is the ideal breakfast drink if you’re looking for a healthy and vegan smoothie recipe. I’ve been making fruit smoothies for the past few years, and during that time I’ve been enjoying them almost every single morning without fail. Even when Mr. Savory Tooth and I travel, we try to bring our compact blender with us whenever possible. 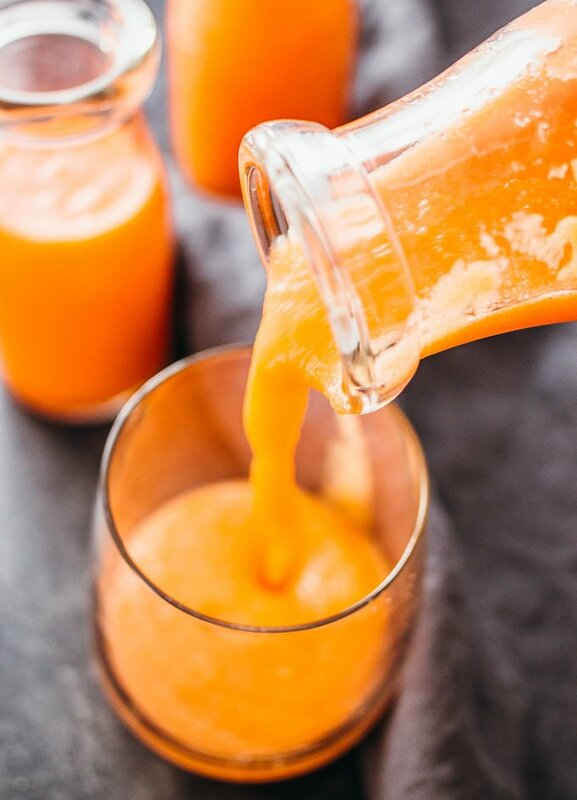 Mornings just don’t feel right without drinking our smoothies first thing after waking up. These smoothies are not only packed with fruit but also with vegetables such as carrots, spinach, or kale for extra nutrition. Fruit tends to be pretty sweet so the vegetables help balance the taste. To ensure these smoothies are filling enough to serve as the entirety of my breakfast, I love adding extras such as oats, chia seeds, flax seeds, and nut butters. 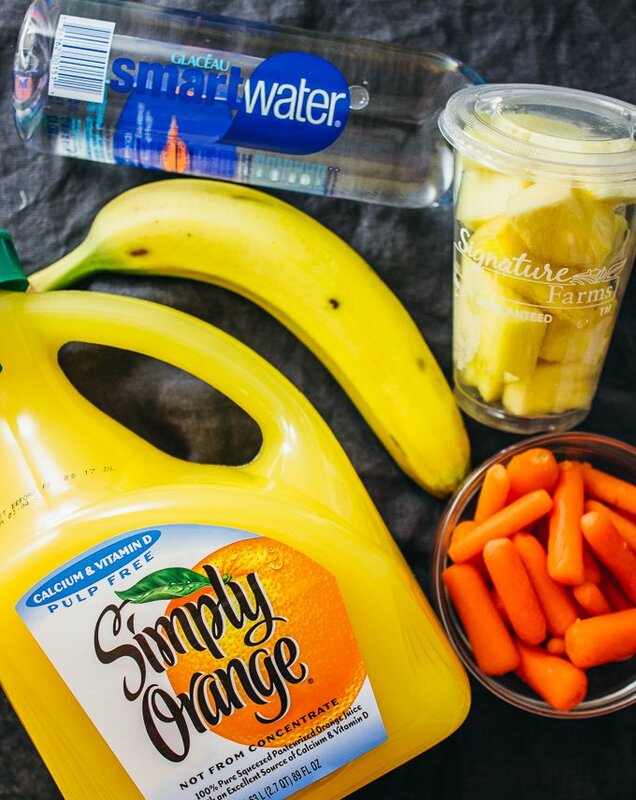 This is a simple pineapple smoothie recipe with only 5 ingredients: fresh cut pineapple fruit, banana, carrots, orange juice, and water. I’ve affectionately dubbed this my doubly orange smoothie because of the orange juice and the orange-colored carrots, and I love the resulting tropical orange color. You can use this recipe to make a simple smoothie if you’re just getting started making smoothies, or as a template for more complex concoctions. This easy pineapple smoothie is great for those of you looking to start this new year with healthier breakfast habits. I’ve found that a good rule of thumb for fruits and vegetables is a 1:1 ratio in weight. I like to fill about half of each smoothie with carrots and the other half with an assortment of fruit. For this pineapple smoothie, fruits that pair well with pineapple include strawberries, mangoes, and bananas. I encourage you to experiment and discover what you enjoy in your smoothies. If you’re drinking these smoothies every day like I am, you’ll want to make them in batches. I make 4 smoothies at a time, where I assemble all of the ingredients (sans liquids) into cups with lids and place them in the fridge. Each morning, I’ll take out a cup, fill it up with water, and blend. It makes for a fast and hassle-free breakfast. 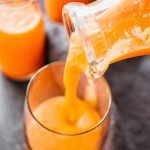 This pineapple smoothie is blended using carrots and fresh fruit such as chopped pineapples and bananas, and is easy to make with only 5 ingredients. This is the ideal breakfast drink if you're looking for a healthy and vegan smoothie recipe. Add all ingredients to a blender container. Thanks for recipe. If u add how many calories in , it’s adding more to your recipe & we get more benefits. Can i use ice ?? And fresh oranges ?? Hi Joseph, yes you can use ice and fresh oranges. Can you use Keefer instead of water? I haven’t tried that. It would probably change the taste of the smoothie. Let me know if you give it a try! Hi, is this a one serving recipe? If not, what is one serving. Thanks for posting! Yes, this makes 1 serving. Hi, this smoothie sounds delicious. I am having bariatric sleeve surgery and looking for easy healthy smoothies and this sounds perfect. I only have one question. Do you cook carrots before blending? Hi Judi, the carrots are raw, not cooked before blending. Let me know if you have other questions! 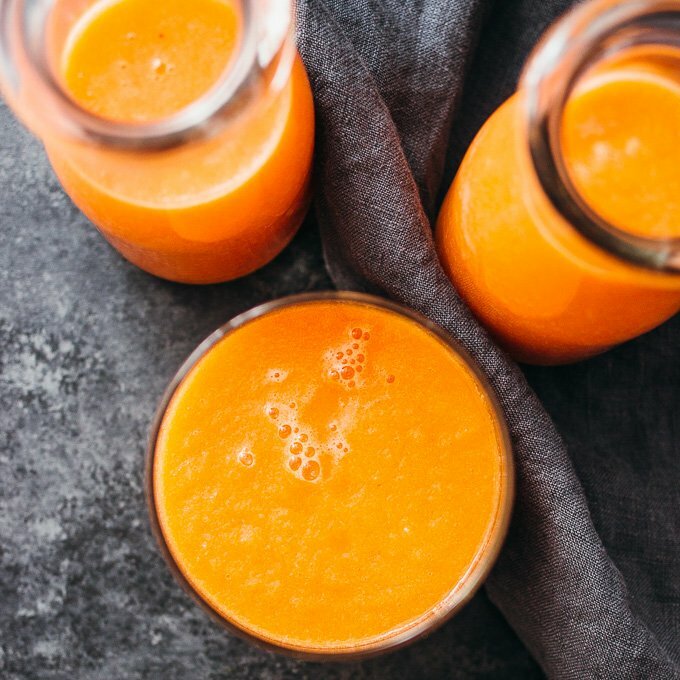 I have used raw carrots in smoothies, but I prefer to cook them, to make them a bit easier to blend. Of course, it you have some sort of super duper blender, it may blend the raw carrots just fine. Can you substitute yogurt for banana. I’m not a fan of banana’s. Yes, that would work. The smoothie will be a little thin without banana, but the yogurt will help thicken it. Nice combination of Banana, Orange, Pineapple and Carrot. Add 1 shot per serving of Malibu Coconut Rum to supercharge it. Great recipe, arrrr!